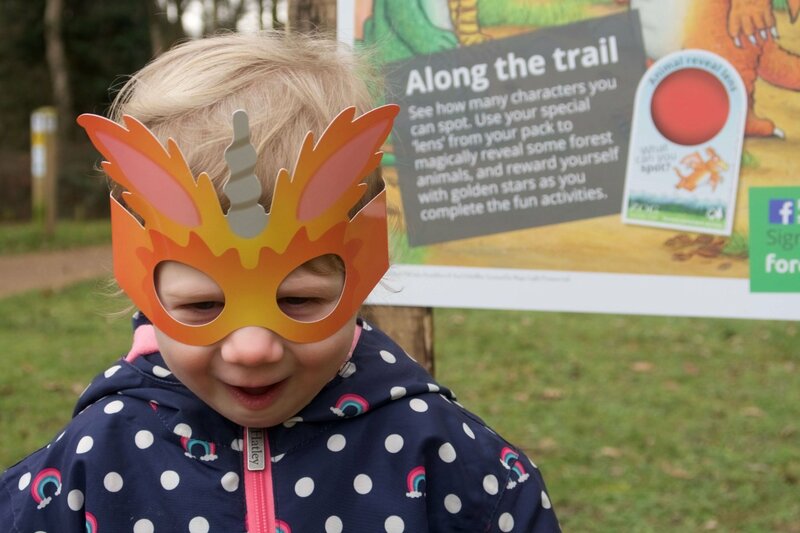 On Sunday, we visited the Zog Trail at High Lodge, Thetford Forest. M received a copy of the Zog book for Christmas, and enjoyed the T.V. adaptation, so we thought she’d like to do the trail, too. We bought M an activity pack for £3. We usually wouldn’t bother with things like this as we generally think that they’re a waste of money. 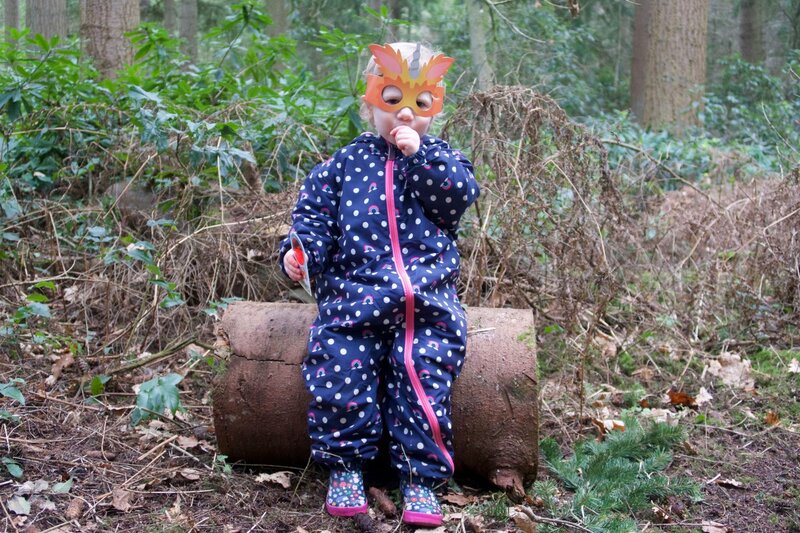 However, a couple of days before M had seen a picture on Instagram of a little girl wearing a Zog mask, when I was researching the trail, and hadn’t stopped going on about it. So I’d have felt a bit mean if I hadn’t let her have one! I have to say, it was worth every penny to see the way her face lit up when we put her mask on. She was absolutely thrilled with it, and hasn’t stopped talking about it since. 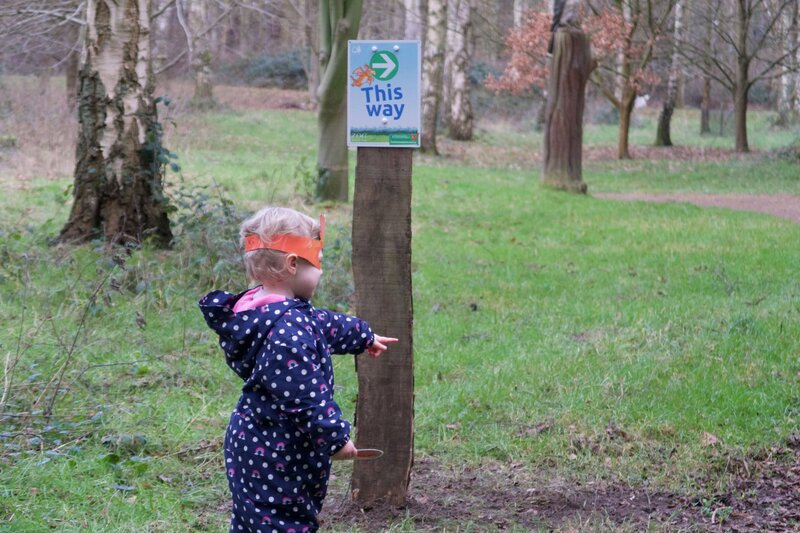 Also included in the activity pack is a viewfinder, which you can use to view special pictures on both the signs along the trail and in the booklet included in the pack. 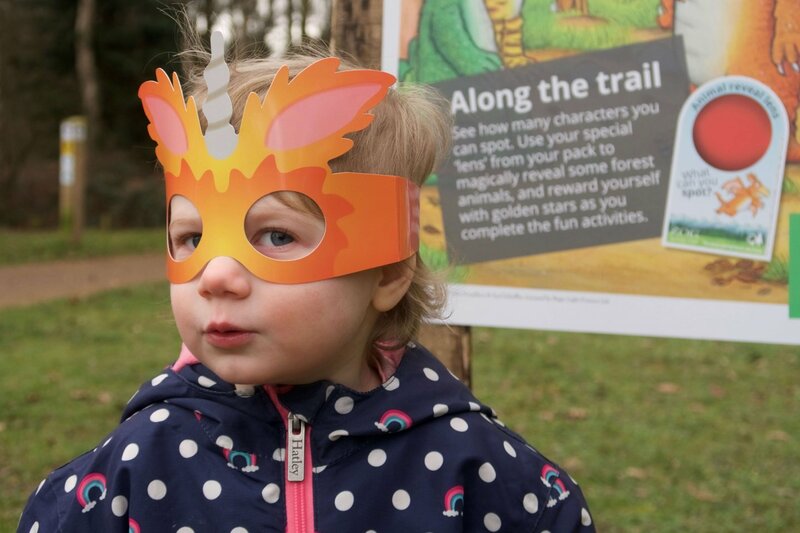 There is also a booklet with additional tasks to the ones on the trail, a pencil to complete various tasks and riddles, and of course, Zog’s gold star stickers, which you can earn by completing challenges along the trail. M was in her element all the way along the trail. She wore her mask all the way to the end, and ran along from sign to sign, clutching her viewfinder, often holding it up to her eye as she went. At two and a half, M is obviously too young to be able to read the signs. 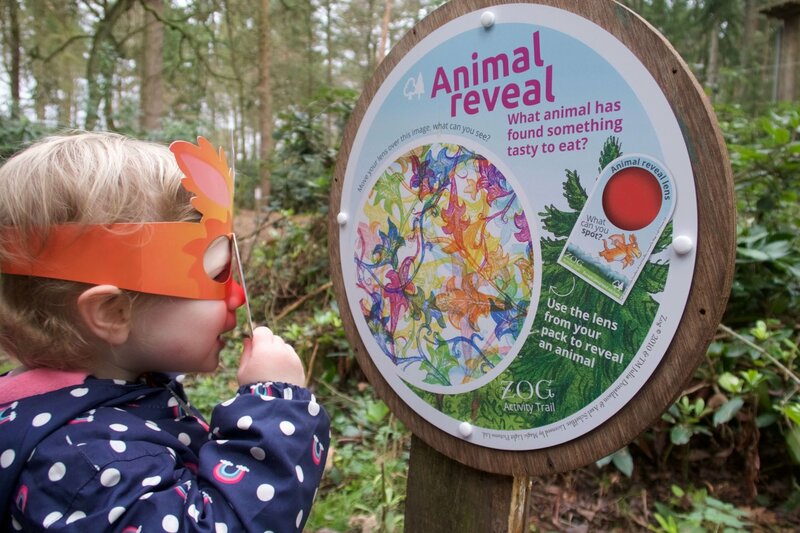 However, she enjoyed looking at the arrows and pointing us in the correct direction to walk, and squealed in delight, “ooh, there’s another Zog picture!” each time we reached a new challenge board. The challenge boards are fun and work hard to link the story of Zog, to learning about the forest. 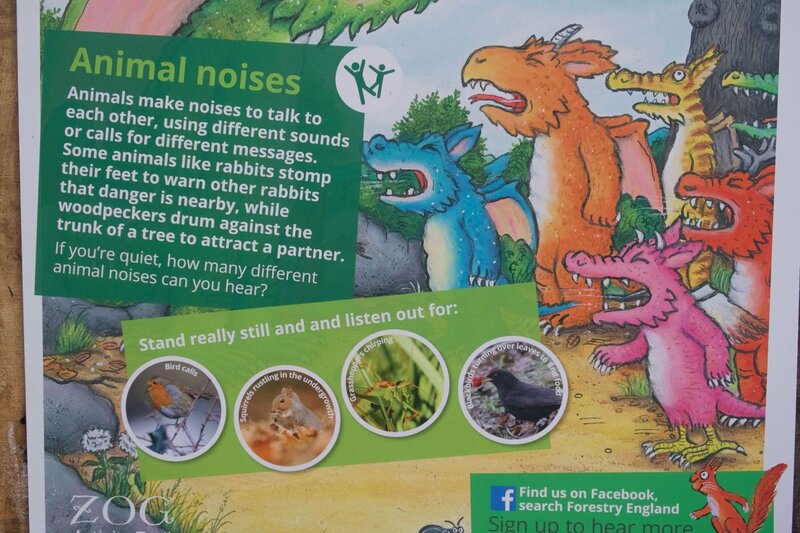 For example, Madam Zog teaching the dragons how to roar in Year Two, is linked to listening to the sounds of the forest. Zog Trail – How long does it take? The Zog Trail at High Lodge is one mile long. It’s pretty flat and smooth, although it is through woodland, obviously, so it is quite uneven in places where tree roots are pushing through the earth. We managed quite easily to push the pram around, and M didn’t trip once (which is quite unlike her as she usually manages to fall over at least once on a walk!). I wasn’t paying attention to how long the trail took us to walk, but we were at High Lodge for less than three hours, and that included a jacket potato lunch in the cafe, and a long wait for the baby change (there is a baby change in both the male and female toilets, but I couldn’t fit the pram (we took the Uppababy Vista) through the cubicle door of those; so I had to wait for the only disabled/baby change room on site). I suppose ultimately, it depends on the age of your children and how long they spend engaging in each of the activities. 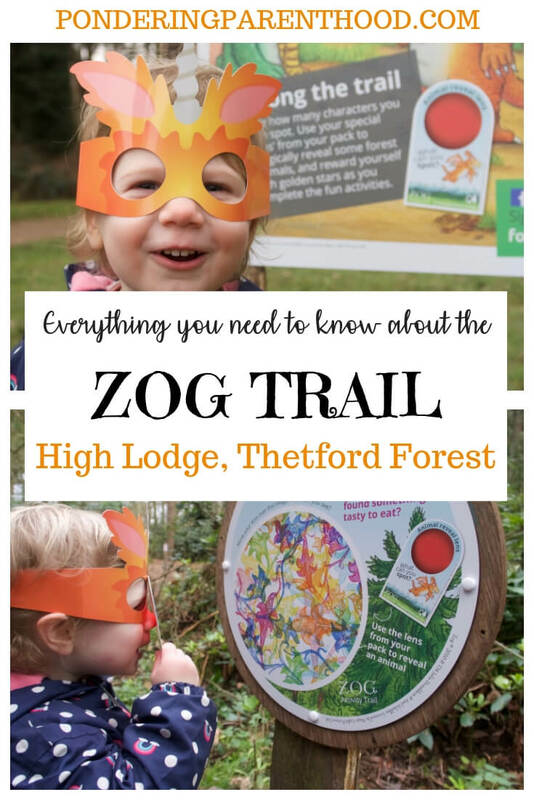 We really enjoyed the Zog Trail at High Lodge, but I was a little disappointed that there weren’t any Zog sculptures, like the ones that are there for the Gruffalo trail. I was expecting a little more than some illustrated signs. M absolutely loved it, though, and hasn’t stopped talking about it since. She even wanted to wear her Zog mask for dinner when we got home! 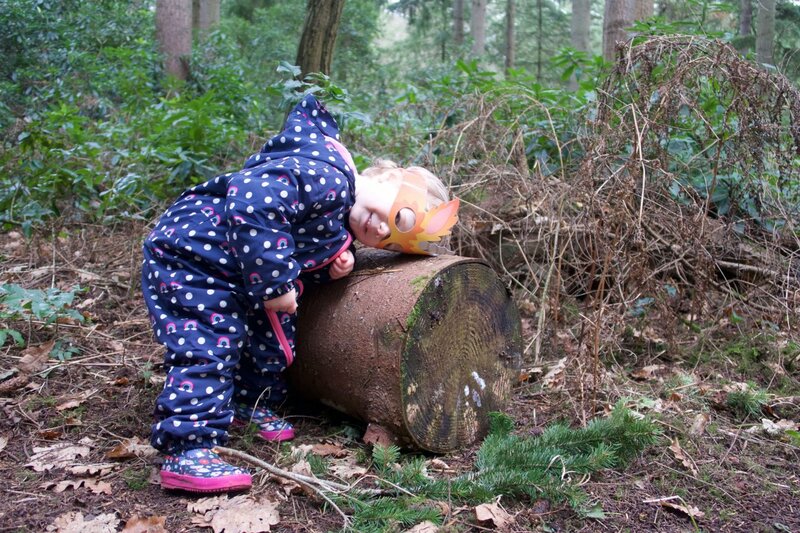 She had such a wonderful time gallivanting about in the forest, rushing from sign to sign in excitement, hugging logs (it was a challenge!) and peering at the special pictures on the signs through her viewfinder. 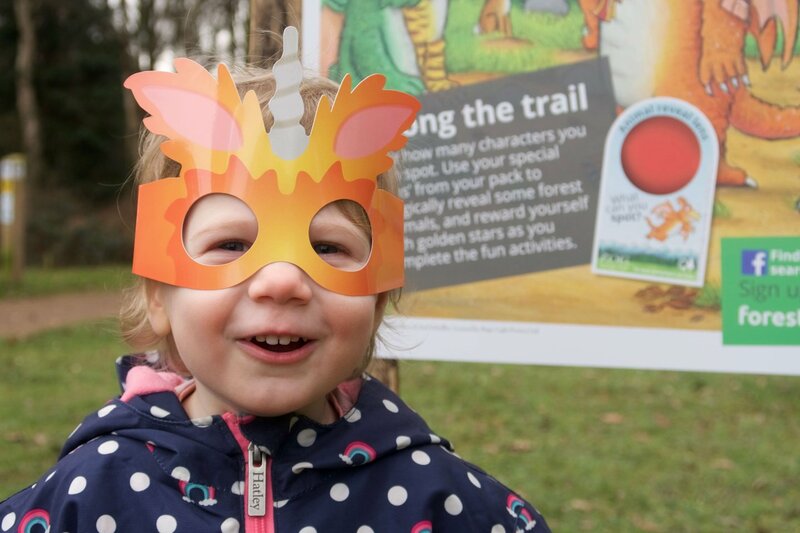 I think you could still enjoy the trail without spending the £3 on the activity pack, but having it definitely enhanced M’s experience! P.S. If you or your little ones are fans of Zog, then check out my Zog sticker by numbers colouring activity! 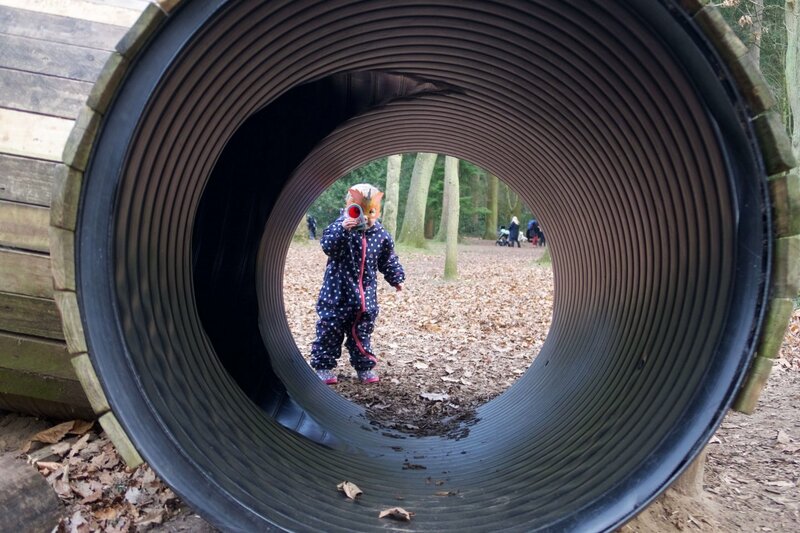 "Pondering Playtime // That’s Not My Hedgehog Sensory Painting"
I think the gruffalo trail was so good it will be hard to beat it with all the sculptures that they had but I love the idea of the Zog one, my children are a little too old to like Zog and the baby is a little to young to appreciate it at the minute, but I love the the trails as a way to get children interested when out on walks!